Kanye West's Yeezy Season 4 show may have been critically panned, but the rapper-turned-designer insists his fashion collaboration with Adidas is one of the 'top four trendsetting brands'. 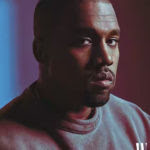 The 39-year-old, who covers W magazine's first-ever his-and-hers fashion issue, spoke candidly with the publication about his frustrations with the fashion industry, explaining that people don't take his designs seriously because he is a musician. Last week, Kanye caused fashion mayhem when he bused editors and other guests to his Yeezy Season 4 show at the abandoned Smallpox Hospital on Roosevelt Island. Not only was the designer slammed for his show, which started late and saw models fainting in the heat, but his latest collection received some of his worst reviews to date.